The ‘raining’ champion they’re calling the Audi Q3 – rather appropriate considering our stream of awful weather in these summer months! Is it a champion? Well, I’ll leave that to your discretion. 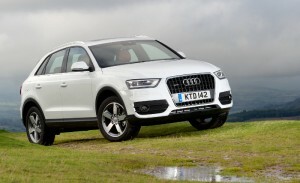 The Q3 is fitted with a 2.0 litre diesel engine, kicking out a 140bhp. Although the Audi Q3 is not made for speed, it will do 0-62mph in less than 10 seconds and accomplish 122mph where conditions allow. A return of 49.6mpg is very respectable, as are the fuel emissions at just 149g/km. All very impressive! The cabin will seat up to five adults and with the seats folded down there is a loading capacity of 1365 litres, which is more than adequate, although not quite as impressive compared to the SUV we have recently written about. Two trims are available – SE and S. The SE has 17-inch alloy wheels, rear parking sensors, dual-zone climate control, a concert audio system with a 6.5-inch manually retractable colour display screen, preparation for SD card navigation, Bluetooth interface, Audi Music Interface iPod connection and light and rain sensors. If you’re a lover of bigger rims then a further £2750 will secure you 18-inch alloy wheels, along with special interior exterior styling, LED daytime lamps and LED rear-tail lights. This will be the 250th quattro-equipped model released by Audi and they predict it will make 40% of their 3rd quarter sales. Join the celebration and contact us today to set the wheels in motion for the lease or purchase of your next vehicle.